Lusotitan atalaiensis was an impressive european sauropod, belonging to the brachiosaurid tribe of the sauropods. He was 25 metres long with an estimated weight of up to 30 tons. Lusotitan was found in Portugal and lived during the jurassic period. It is one of the biggest dinosaurs found in europe, he was dwarfed by the spanish turiasaurus. Lusotitan had longer forelimbs than hindlegs, typically for an brachiosaurid and a long neck with a small head. Lusotitan was a herbivore. You´re right, I made the crest a little bit smaller, because i didnt want it to look the same as brachiosaurus(Lusotitan was once a Brachiosaurus species until palaeontolohists gave it his one name). And as the head of Lusotitan wasnt foun yet, I thought that his crest may could be a little bit different in shape but thats just hypothetical. I noticed the less upright neck in my pic too, but I couldnt change it as the pencils I use(a o,5 mm mechanical pencil, a 0,7 mechanical pencil and a 2mm mechanical pencil) make so dark lines that i couldnt erase the contures of the neck. I'm not sure where you got those figures... Turiasaurus wasn't even close to 37m long. I haven't seen that number in ANY reliable source. A few websites say 30m, but that's it. However even 30m is excessive. 26m may be a more accurate estimate, and that's mostly tail. A lot of people overhype Turiasaurus, 'oh how wonderful that primitive sauropods could be the biggest' LOL... well it wasn't the biggest, not even close. 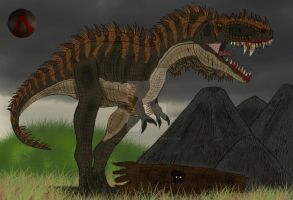 It was big compared to its rather unimpressive relative Galveosaurus, but it certainly didn't approach monsters like Argentinosaurus, Futalognkosaurus, or even an adult Brachiosaurus or Giraffatitan on anything like equal terms (most Brachiosaurus and Giraffatitan remains are teenagers). We're talking about an Apatosaurus ajax-sized body here, with Turiasaurus. Big for its primitiveness, but nothing special compared to other sauropod families. I read it on some internet pages, and on wikipedia i got the scource: the estimated lengh comes from:American Association for the Advancement of Science. Giant Sauropod dinosaur found in Spain. www.eurekalert.org. It also estimazes its weight as 40 -48 tons. Wow! This is one of the most great Sauropod drawings i ever seen!